When I was first officially "schooled" in photography way-back-when at Florida State University it was with a basic, strictly manual Nikon film camera and black and white film where we captured, processed and developed all of our own film. I can still remember the cool dimness of the darkroom (with the sweltering Florida heat just outside its doors). It was a dreamy retreat that place. Even in a time without the instantness of digital photography (yes, it was that long ago) the process of waiting and working for a single image was a welcomed reprieve from the hustle and bustle of college life. I fell in love. Fast forward a few years and my digital camera and I are inseparable. 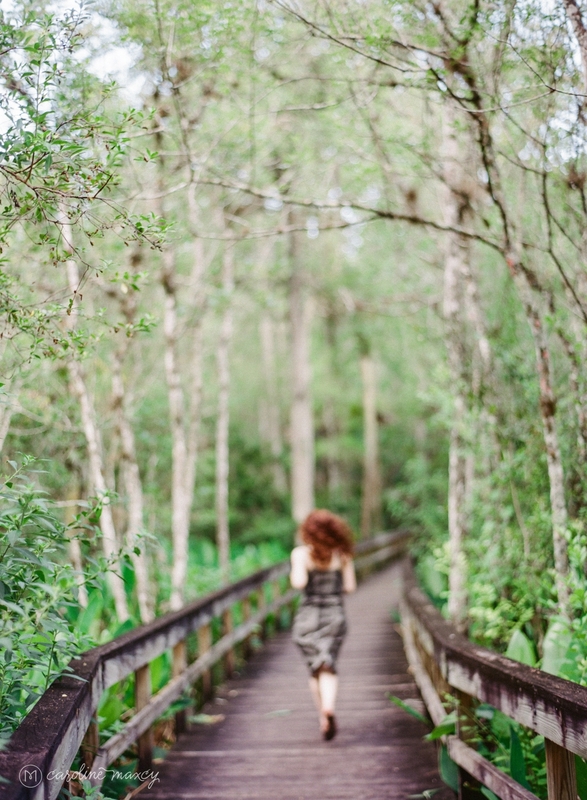 The instantness is efficient, helpful and perfect for a growing photography business. And the images that a DSLR can create are getting better and better. I capture hundreds of images on a single shoot and thousands on a wedding day. Minute expressions and handfuls of emotions. It's sometimes like a little stop frame animation movie and I love this. I love that somewhere in the 20 photos I capture of a bride and groom snuggled up in that perfect golden afternoon light, they catch each other's eyes, there's a spark and they glow. Film is different. And I have to admit I've been scared of going back. My shooting style is so much about capturing that glowing expression and emotion that I'm afraid I'll miss it in the waiting. That I'll click just a half second too late and it will be gone. While I've watched the commercial photography industry for years now slowly making its way back to film I've done just that. I've watched and waited. Photographers talk about the romanticism of film and the images captured, the perfect minty tones, the way the process has made them better photographers and I've watched and waited. When I talk of my thoughts towards film and the possibility of exploring it again with my non-photog friends their question always is, "Why? Will it make you more money? Are there people that are looking for that?" Which are all valid questions, but in my response I have found that my motivation for picking up a film camera again more so than not entirely about myself. It is about me as the artist, the artistry behind it and cultivating my own art creation process. Its about becoming better at what I do not by grasping for more but in leaning into what is already right there in front of me, weeding out the mess and waiting for the more to bloom. There is a beauty in the process of waiting not to catch an image but for that image to arrive. Eye to the view finder. Lens focused. Waiting, breathing, feeling. The emotions of the moment crest and fall. And then there it is. That golden, glowing, emotion filled image appears. A millisecond. Click. It's hard to miss something you are so in-tuned to. Last month I did just that. I finally stopped watching and picked up a film camera again. This time it is the one all the cool kids use a Contax 645 rented for a long weekend from the lovely Contax Rental (who also sells Contax Kits). I bought a few rolls of film and explored the process. What fun it was, but despite the fact that I kept looking at the back of the camera after every click to see an image, no image appeared. I had no idea how I was doing. So I packed up my exposed film rolls, sent them along their way to The Find Lab and began the process of waiting again. When I got back the processed, developed and scanned images my heart swelled. I was in love once again. I captured images across the span of a few sessions I had that long weekend and I will share more of those with you all with each session. 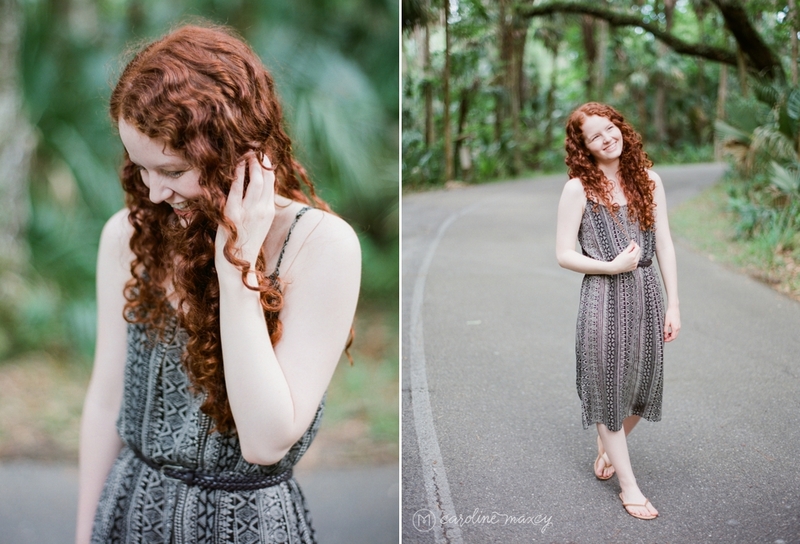 But for today you get to see a little peek into my film exploration when on a Sunday afternoon the lovely Hannah and I ventured into Highlands Hammock State Park with my borrowed Contax and a few rolls of film. While we talked over life we explored the dreamiest of places and from time to time I lifted the camera to my eye and waited for a moment to arrive. Click.